I am rereading books from years past that I love. 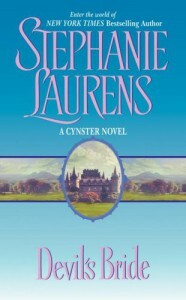 Stephanie Laurens Cynster Series is one of my favorites. The Devil Duke was the best. She has many that have sprouted from this series and I have them all. Devil The Duke of St Ives is the head of a rather large family. Him, his brother and his cousin have a reputation with the ladies and the men as being no one to mess with. They leave the innocents alone but all else is game. Devil comes upon a young lady trying to save the life of his young cousin "she doesn't know it's his cousin" who has been shot. They are forced to spend the night in a small cottage Devil says they are to be married. Honoria says no. The Devil is not use to the word NO. I love this story. The mystery and the surprise of the cousins murderer and the strong personalities of our h/h are so interesting. Devil is a super alpha male. Head of a large group of alpha males. Can he be tamed just a little?